The largest of the AVIS reservations. Maple, birch, oak, hickory and sassafras trees can be found in these serene woods. Tall white pines grow along the ridges and hilltops and the ski loop trail passes through lovely hemlock groves. The forest floor is carpeted with ferns, partridgeberry and teaberry. Deer, beaver, fox and numerous bird species have been observed here. Rafton is the largest of the AVIS reservations. In 1968, this property was named for Harold R. Rafton, Andover’s “sturdiest conservationist.” Mr. Rafton’s ability to persuade landowners to sell or bequeath land to AVIS for conservation and public use is legendary. 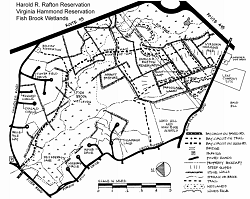 Rafton Reservation was once farmland and woodlot. Many of the old stone walls remain, evidence of this area’s agricultural past. An annual winter breakfast followed by skiing or hiking through the reservation has become a modern AMC and AVIS tradition. Between High Plain Road to the Southwest, Interstate 495 to the Southeast, and Interstate 93 on the Northeast. High Plain Road leaf composting area lot.